Biographies of Alfred the Great continue to be written; this is not a complete list as it does not contain the more recent biographies by Peddie or Smythe, rather it is a list of books in my own collection. Mostly 19th century, particularly around the time of the Millenary Celebration. As biographies go out of print, others need to replace them, I hold the view that any new biography of Alfred the Great is likely to be simply a re-working of previously published material. Dr. Pauli's biography probably remains the definitive one, although later writers in my opinion have set down the material in a more interesting fashion. Anything additional to Dr.Pauli's work is more likely to be some snippet gained from a local archive, an archaelogical discovery, or a discussion on the monuments to Alfred in the 1,000 years since his death. Asser. Life of Alfred the Great. The original source of our knowledge, runs to only about 40 pages. It was published by Messrs Bohn & Co in 'Six Old English Chronicles'. Interesting to read Asser's own words. Sir John Spelman (1594-1643) Life of Alfred the Great. Was first published in Latin in 1678. Although there were earlier biographies of Alfred, this is notable for being the first biography of Alfred the Great to be published in English in 1709. Dr Reinhold Pauli. Life of King Alfred.Dr. Pauli was a refugee from Germany who settled in Oxford around 1848 and devoted his study of King Alfred with more thoroughness than previous students. The book was originally written for the German market, but as an English biography was considered wanting, a translation was made by Thomas Wright, and revised by Dr. Pauli. The book was published by Richard Bentley in 1852. Another translation for Messrs Bohn & Co was made by J.A.Giles. All subsequent biographies of King Alfred owe their existence to Dr. Pauli's work. The Complete Works of King Alfred the Great. When the Millenary of the birth of Alfred was commemorated in 1849, a committee was set up, who decided to publish the Jubilee edition of the complete works of King Alfred the Great. The project took nine years to complete, and the work appeared in 3 parts published in 2 volumes in 1858. The work contains translations of all his books, letters, charters, and his will; plus essays on his life, laws, and coinage. Thomas Hughes (1822-1896) The Life of Alfred the Great. Thomas Hughes was born at Uffington, near Wantage, Berkshire. This biography of King Alfred was published in 1869; it should have been better as Hughes was a local man, but has been spoiled by the constant references to the political problems in Europe at that time. Hughes mentions King Alfred and some Alfred monuments in his earlier book 'The Scouring of the White Horse", published by Macmillan in 1859. Arthur George Knight. The Life of King Alfred the Great, Published by Burns and Oates in 1880. Knight in his preface says "Alfred, as he is held up to popular veneration, is not the Alfred of genuine history. He owes part of the favour with which he is regarded at the present time to a complete misconception of his character and mission. Motives are freely imputed to him which, if his own acts and words are to guide our judgment, we may be sure he would have repudiated with indignant energy" An excellent study of Alfred, with notes at the end of each chapter, and an Appendix showing how Alfred was viewed by the Medieval historians. Alfred Bowker (Editor) Alfred the Great: containing chapters on his life and times, published in 1899. Alfred Bowker was the Mayor of Winchester and responsible for the Millenary Celebration. The book contains seven chapters by different writers; there is an excellent chapter by Charles Oman on Alfred as Warrior. The author really manages to convey to the reader just how desperate was the situation when Alfred was hiding among the marshes of Athelney. J.Hunt Cooke. Life of King Alfred the Great, published in 1899 by S.H. Burrows & Co, London. Cooke was a writer on religious matters and a contributor to the 'Baptist Review and Expositor'. This was Cooke's contribution to the Millenary celebrations; although only 69 pages, the author has managed to get a lot into a small space. A very rare book, neither the British Library, London, or the Bodleian Library, Oxford, possess a copy of this title. J.Charles Wall. Alfred the Great: his abbeys of Hyde, Athelney and Shaftesbury, published by Elliot Stock in 1900. In the preface the author gives his reasons for writing the book. "In commemorating the one-thousandth anniversary of the death of Alfred the Great, that part of his work should not be ignored which he intended as a permanent series of institutions for the comfort and enlightenment of his subjects and their posterity, and for the consolidation of the kingdom of England"
Jesse Page. Alfred the Great: the father of the English, published in 1900. This is a highly readable biography of King Alfred. I particularly like the subtitle 'Father of the English', because this is what Alfred was. Everything he did was for the benefit of his people. The schooling, the writing of books in English, rather than Latin, and the Anglo-Saxon Chronicle, so that people could read a history of their own country. There was never anyone like him before or since; and in the history of this country he stands head and shoulders above every other Englishman: quite an accomplishment for a man who died more than 1,000 years ago at the age of 50 years. Dugald Macfadyen (1867-1936) Alfred the West Saxon: king of the English, published in 1901 by Dent, in their Saintly Lives series. The book was intended to be ready for the start of the Millenary Celebration but the original author was prevented under medical orders to continue; Macfadyen was brought in to complete the job. He spent twelve months on the work, and although he apologises for the end result, I think he did an excellent job. There is a very detailed study of Alfred's translations. especially his 'Consolations of Philosophy'. The book contains illustrations and photographs, some not found elsewhere. A worthy addition to any Alfred collection. Richard Charles Jackson. Alfred the Great of Blessed Memory: memorials concerning England long anterior to the reign of King Alfred dug out of long forgotten lore, published by the Bowyer Press in 1901. Contains information and illustrations not found in other publications. A very rare book, the illustration is of Jackson's own copy. Warwick H.Draper. Alfred the Great; a sketch and seven studies, published by Elliot Stock in 1901. In the preface the author states "This sketch of Alfred's career is an attempt to portray the salient features of his reign, and suggest its place and value in our national story". Contains 19 illustrations. Another very rare book, despite the fact that it ran to two editions. Sir Walter Besant. The Story of King Alfred, published by Thomas Nelson in 1901. Besant was actively involved during the Millenary Celebrations, but died before its completion. His small tribute to King Alfred (16mo, 207 pages) was distributed among those attending the celebrations in the U.S.A.
Alfred Bowker. The King Alfred Millenary: A Record of the Proceedings of the National Commemoration, published in 1902. The preface reads "The commemoration of King Alfred the Great at Winchester in September last having proved of so much more than passing interest, a widespread demand has arisen for a printed account of the proceedings. A wonderful book with numerous photographic illustrations. 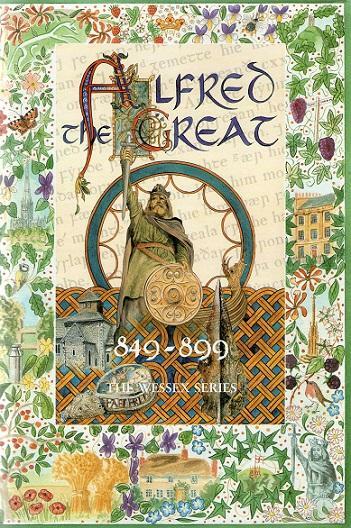 Anyone with a deep interest in Alfred the Great should possess a copy of this book. A.E. McKilliam. 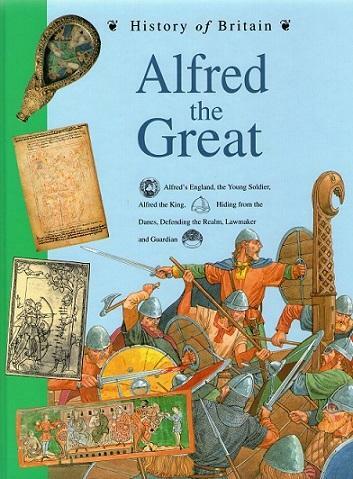 The Story of Alfred the Great, published by George Harrap in 1914, as part of their 'Heroes of All Time" series. The final chapter gives a fairly detailed account of the Millenary Celebrations in Winchester in 1901. Beatrice Adelaide Lees. Alfred the Great: the Truth Teller, Maker of England, published by Putnum in 1915, as part of their ' Heroes of the Nations" series. This should have been published in time for the National Commemmoration. In Putnum's catalogue for 1900, a volume entitled Alfred the Truthteller was being written by Professor F. York-Powell, but in 1908 the title was still being listed as a forthcoming publication, only now the author was to be Frederick Perry. When the book finally emerged in 1915 its author was Beatrice Adelaide Lees, a former tutor at Somerville College, Oxford. By the time the book appeared the binding and format had changed (from standard 8vo to large 8vo), so that it does not match the earlier titles in the series. The book is a superb study of Alfred, and contains 49 illustrations, the majority not seen elsewhere. The author discusses the myth of Alfred from the time of his death to the time the book was written. This is a worthy addition to any collection of Alfred books. G. Lacey May. Alfred the Great. Published by the Society for Promoting Christian Knowledge, 1938. 28 pages. L. Du Garde Peach. 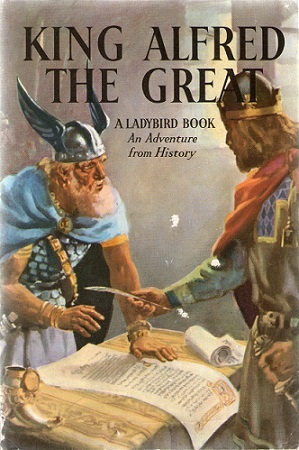 King Alfred the Great, published by Wills and Hepworth in their Ladybird series. This very popular childrens book has been included because of the outstanding full-colour illustrations by John Kenney (died 1972); the book contains only 51 pages yet the author has been able to cram in a lot of information. Highly recommended for the illustrations. This was my introduction in the 1960s to the life and achievments of Alfred the Great. Douglas Woodruff. 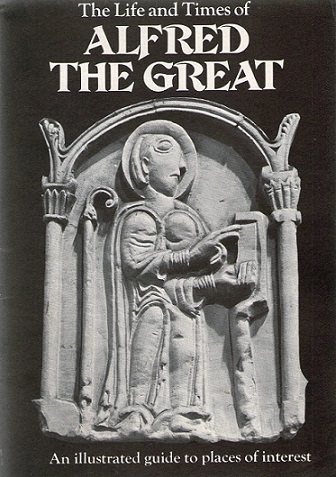 The Life and Times of Alfred the Great, published by Weidenfeld and Nicolson in 1974. Contains 16 colour plates and 100 illustrations in black and white. Worth adding to any collection for the illustrations alone. A 32 page companion to the above book; contains photographs not in the main volume. Brenda Williams. Alfred the Great. Published 1994 by Hamlyn Books. 24 pages. Illustrated by John James. Douglas Stuckey. 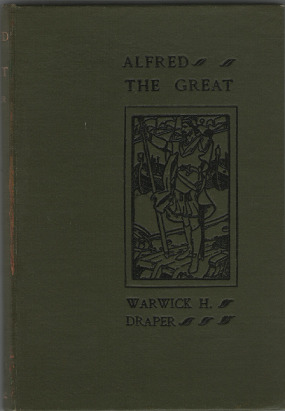 Alfred the Great, published by Wessex Books, undated, but published around the year 2000. 28 page softcover, well illustrated. Similar in style and format to Pitkin Pictorials.